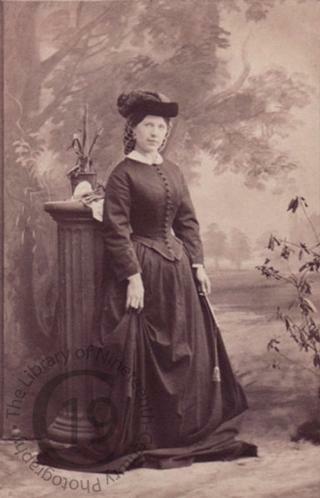 A carte-de-visite portrait of Marie Wilton (1839-1921), later Lady Bancroft. Born Marie Effie Wilton, the daughter of provincial actors, she performed on stage from a very young age. Her London debut in 1856 as Perdita in A Winter’s Tale met with great success. She continued to perform, particularly at the Strand Theatre, over the following decade. Deciding to move into theatre management, she borrowed £1000 and renovated an old theatre off Tottenham Court Road, nicknamed ‘the Dust Hole.’ Renamed the Prince of Wales’s, it opened in 1865 and quickly became one of the most popular theatres in London. In 1867, Wilton married another actor in the company, Squire Bancroft. Together they initiated many reforms in theatre management, raising salaries and providing costumes for the cast. The Bancroft management of the Prince of Wales’s is considered the beginning of a new era in the development of the English stage and the revival of the London interest in modern drama. In 1880 the couple moved to the Haymarket Theatre, which they extensively restructured, enclosing the stage within the proscenium, so that it appeared like a picture to the audience. It was the first ‘picture frame’ stage in theatre history. The new designs allowed the building to hold 880 people. Other drastic alterations included the disappearance of the pit in favour of the stalls. Having made a considerable fortune, they retired from the stage in 1885, but Squire Bancroft returned one last time to appear with Henry Irving in 1889. Squire Bancroft was knighted in 1897 for his contribution to the theatre. The couple published two volumes of memoirs Mr and Mrs Bancroft, On and Off the Stage (1888) and The Bancrofts: Recollections of Sixty Years (1909). Photographed by Camille Silvy in the spring of 1860.